One of our favorite holiday traditions is taking time to just take in the sights of the holidays. This year, I decided to surprise them and take them to see the L.A. ZOO LIGHTS. 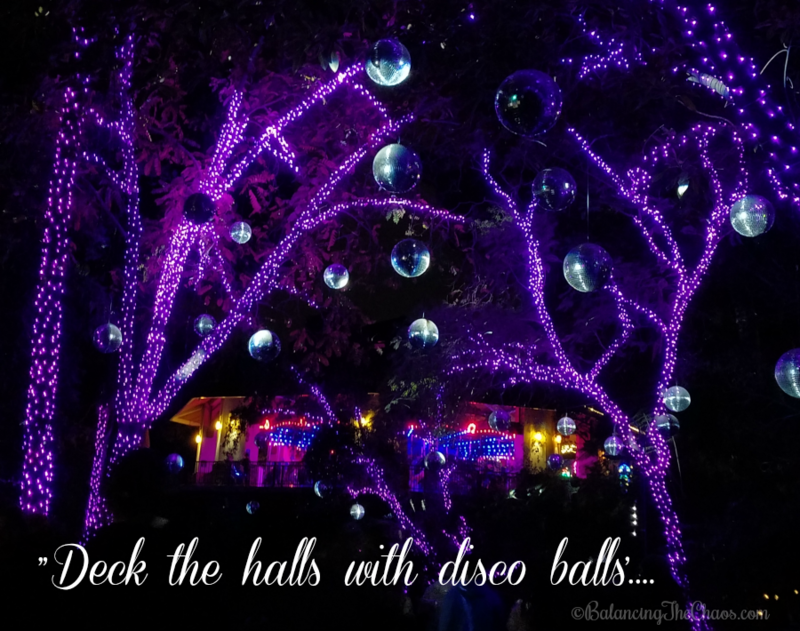 Returning for the fourth year, guests can enjoy the shimmer of the season along with the animals at the Los Angeles Zoo, set aglow with LED lights by the thousands, a disco ball forest, glittering twinkle tunnel, stunning 3-D animated projections and much more. 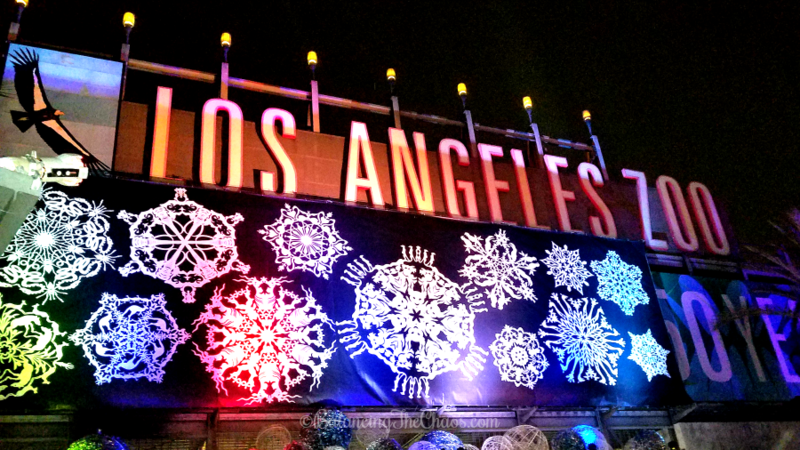 Enjoy the dazzling fun now through January 7th (except November 23, December 24 and December 25) from 6 pm to 10 pm nightly at the Los Angeles Zoo and Botanical Gardens. This year, they have added a burst of breathtaking new features including a dynamic, musical holiday tree experience, a reimagined water show, a glittering “North Pole” setting for Santa photos, glowing “Northern Lights” featuring animal constellations that come to life, and an all-new “Wild Wonderland” finale spotlighting endangered and vulnerable species. The L.A. Zoo Lights was established by the private, non-profit Greater Los Angeles Zoo Association (GLAZA) as a festive annual tradition to celebrate the Zoo’s important role as an international leader in the preservation of endangered species, a conservation center for the care and study of wildlife and a special place for people of all ages in the world’s entertainment capital. An instant hit since its 2014 debut, L.A. Zoo Lights is the perfect family evening. Make plans for just your family, or make it even more special and meet up with friends. 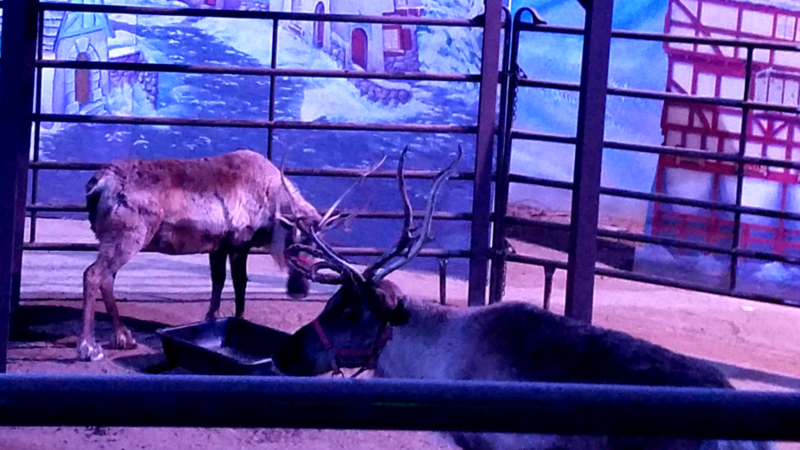 While most animal residents are asleep, visitors can enjoy the only opportunity in Los Angeles to see a herd of real reindeer in their “Reindeer Village” habitat. 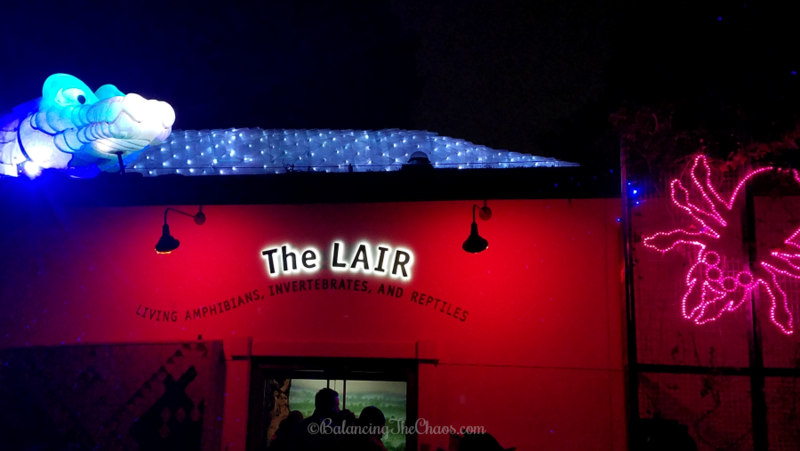 Additional animals guests will have the opportunity to visit are the amphibians, invertebrates and reptiles in the festive LAIR, which also boasts black-lit “insects” scurrying above the rock walls. An inventive collection of animals depicted in lights range from frogs, meerkats, flamingos and monkeys to a glowing savanna with a “stained glass” condor, giraffe, elephant, polar bear, and rhino. Photos with Santa on select dates are available for an additional fee in a glittering “North Pole” setting to capture holiday memories, and the Zoo’s hand-crafted Tom Mankiewicz Conservation Carousel is open during L.A. Zoo Lights, with $3 per person on-site tickets. While you’re enjoying the L.A. Zoo Lights indulge in delicious cups of steaming hot chocolate churros, Dippin’ Dots, Smore’s Sundaes, handcrafted gourmet pizza slices, craft beer by Golden Road Brewery and sweet and savory pretzels with warm dipping sauces, and light-themed souvenirs are available for sale. Want to make it an even more memorable experience? This year they are offering VIP Experiences and a FAMILY NEW YEAR’S EVE on Sunday, December 31, 6 pm, provides an opportunity to celebrate the coming of 2018 in style with “skip-the-line” express entry to L.A. Zoo Lights, dinner buffet, soft drinks, a glass of complimentary champagne for adults, sparkling apple cider for kids, dessert, a ride on the Conservation Carousel, games, DJ dance party, cash bar and live broadcast of New York’s Times Square ball drop at 9 pm, after which guests are welcome to experience L.A. Zoo Lights until closing. FAMILY NEW YEAR’S EVE tickets are $69 for adults and $45 for children. GLAZA members save $5. Tickets for all three “VIP Experiences” have limited availability, so early purchase is strongly suggested. “Tequila and Tamales” is sponsored by VIVA XXXII Tequila. For more information and details on memberships, visit www.lazoo.org. Sponsors of L.A. 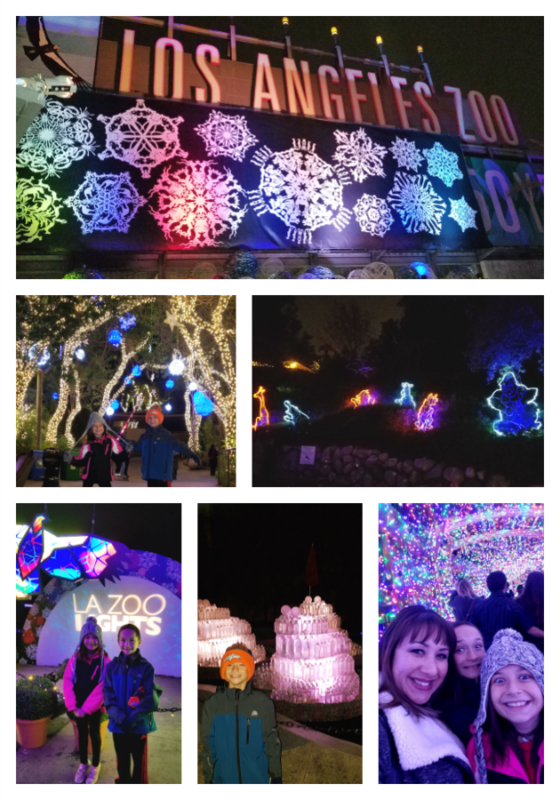 Zoo Lights include Service Systems Associates, 99 Cents Only Stores, SoCal Honda Dealers, Welk Resorts, Cirque du Soleil’s LUZIA and ScholarShare. Denny’s also joins as a first time sponsor and is offering customers who visit Denny’s locations in the Greater Los Angeles Area a free child’s ticket to L.A. Zoo Lights with the purchase of two paid adult tickets starting November 13 through January 7. Complete offer details available at Denny’s locations.